in a quiet farm environment. 100 m. to nearest neighbour. · Living room with satellite TV, DVD-player and sofa-bed. freezer/refrigerator, microwave oven, coffee brewer etc. · Electric heating. Dining-room with a wood burning stove. · Shower/WC and laundry with washing-machine. and two small bedrooms with one bed each. · 6 beds in total. · Garden furniture, outdoor grill. · No smoking. Pets (maximum 2) are permitted. Please contact us for more pictures! 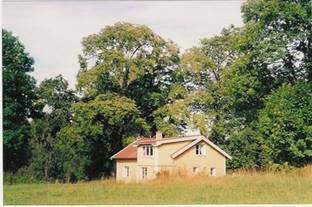 W. 14 – 23 & 36 – 50: 3400:- SEK per week. Also shorter periods possible, minimum 2 nights, price on request. Summer 2019: Presently booked July 20 – Sept. 14.